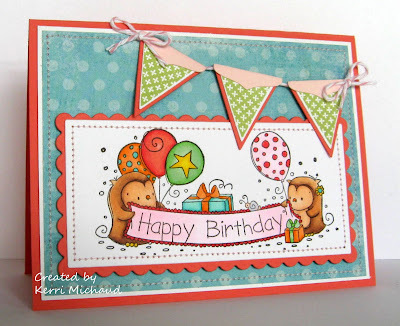 PWCO Surprise Birthday Blog Hop! Click HERE to enter my Blog Candy! Hello! We are hopping along at PaperWorks Co. today, because it's the PWCO boss lady's birthday! Happy Birthday, Peggy!!! I hope you have a fabulous day, woman! If you'd like to join us for the hop then start at the PaperWorks Co. Blog! If you've ben hopping along, then you should have arrived from Danielle's Blog. For my project I used this SUPER ADORABLE image from Rachelle Anne Miller called Birthday Parade. The dp is some My Mind's Eye Tickled Pink and I made the banner using my PTI set Banner Builder and the coordinating banner dies. So cute Kerri! Your cards are always perfectly colored and designed! AWWW Kerri this is as sweet as can be, LOVE your bday creation and this super SWEET image!!!! Super fun colors and oooo I love that banner hun! Happy Friday! Awww, this is so cute!! Simply adorable! Super Cute Kerri!! Love the banner and your coloring is as fabulous as always!! I needed this darling cuteness today! Love it! Such a sweet card! Love your coloring and the adorable banner! Thanks Kerri for the fab card!!! I'm so surprised that you guys would do this for me.. Really touched!!!!! What a pretty card Kerri! I love the cute image. What a sweet card Kerri!! Love the banner and the darling image!! Perfect coloring. Cute image and i love the little banner you put on your card! Fabulous! Adorable card! Really love the banner! Adorable! Love the image!! and colors! ACK! This is SO cute Kerri! FAB image and GORGEOUS coloring! Super cute and fun, the banner is awesome. Kerri this is just toooo tooo CUTE! I LOVE that image.. and the banner is the PERFECT touch!! How cute! Love the banner too!